Doublewoot Online Fashion Store | Malaysia Leading Online Fashion Store | Shop Ladies wear | High Quality Exclusive Women's Wear | Dress | Skater | Rompers | Pants | Blouse. What's My Size? 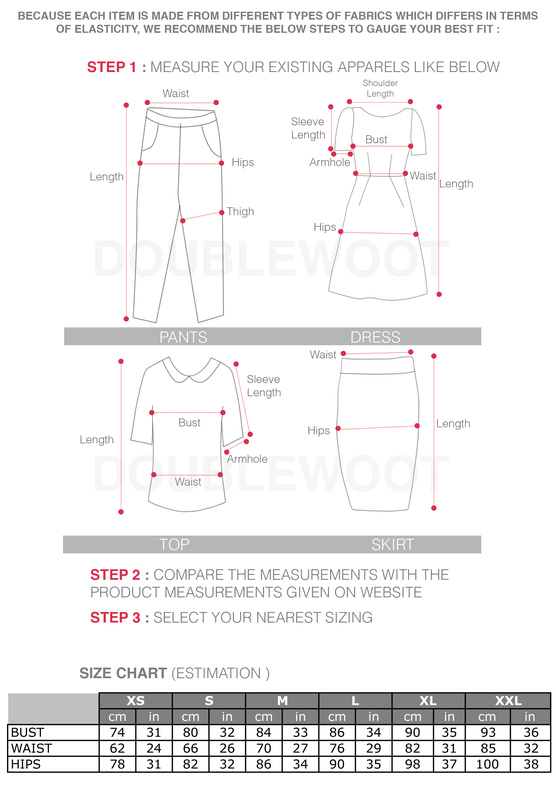 For your info, generally our sizing guide as below. Kindly check your hight waist size tightly to gauge. You should measure with your clothes off and take measurements at your high waist , followed by bust and hips. As you may see on each measurement details on our products, we do have a standardization in terms of its bust, waist and hips measurement on the product. The discrepancy lies in the fabric and cut of the design causing that to not be able to fit every unique physique perfectly. In some case, some cutting might not be suitable for all and you may be in between sizes, In such cases, some opt to send the dress for altering, or for-go such designs. 2) Jot down the measurements taken on a piece of paper . 4) Keep this measurement with you whenever you are shopping at Doublewoot. 5) Do take note that different items has different fit. For items with stretchable material, it would normally be true to size. For non stretchable/slightly stretchable material, do double check on the measurements given or you might want to take one size up if you are in between sizes. If you are still unsure, you may email us for clarifications and we are more than happy to assist to make your shopping experience a pleasant one.